“We will not be silenced, we will not close the lenses of our cameras, and we will continue to report on the escalating Israeli violations, and the soldiers’ attempts to bury the truth, so that they can continue killing and wounding Palestinians with impunity,” begins a message published Saturday by Palestinian journalists. Many reporters testified to being targeted by the soldiers by gunfire and physical assaults while reporting on protests taking place in the southern West Bank governorate of Hebron, and in other parts of the West Bank and Gaza. Nasser Abu Bakr, the chairman of the Palestinian Journalists Syndicate, said at least 60 Israeli violations against journalists and media outlets have been documented this week alone, in several parts of the West Bank, including Jerusalem. He added that the journalists were subjected to live fire by the soldiers who also fired rubber-coated steel bullets and concussion grenades at them, in addition to assaulting many of them. The soldiers also destroyed, damaged and confiscated cameras, preventing the journalists from performing their duty. “We managed to document these violations, and we also collected sworn testimonies from the journalists, which we fully intend to file to the International Journalists Association and the Arab Journalists Association. These Journalists Associations have already issued statements denouncing the violations, and demanding Israel stop the illegal attacks against the media in occupied Palestine. Abu Bakr added that the organization has called on legal and human rights groups to convene and discuss measures meant to protect journalists, amidst this illegal and dangerously escalating targeting of the media in occupied Palestine. 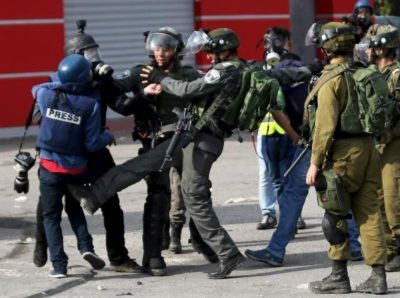 One Palestine TV cameraman in Hebron, Eyad al-Hashlamoun, was quoted in the journalists’ statement as saying, “We as journalists will not be intimidated, and will not shut our cameras down. We will continue to expose the Israeli crimes against the Palestinian people, and highlight this ongoing suffering”. It is worth mentioning that al- Hashlamoun was one of the journalists assaulted this week by Israeli soldiers, who obstructed his work, and prevented him from filming the unfolding events. Al-Hashlamoun and his colleagues were attacked by the soldiers at the main entrance of the al-Arroub refugee camp, in Hebron, and were also used as human shields by the army while invading the camp. Hisham Sharabati, of the Al-Haq Center for Applied International Law, said the organization is documenting these violations, and will soon prepare a video documentary to send to the United Nations.